Taillé pour les clubs, certes, mais passe-partout. 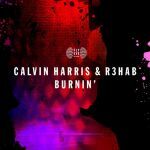 Again with the big room house which has little of appeal to me relative to Calvin's usual sound. Also that drop which sounds sort of similar to "Let's Get Ridiculous" = no, despite how energetic it may be. I think that unless he's going to make something of "Slow Acid" or "School" quality, these instrumental / less vocal-driven tracks should be left off the album. I do like it though, but not a lot. Damit kann ich nix anfangen.